The official first day of Fall is tomorrow and I, like many of you, have already begun dabbling in Fall styles. One of my go-to pieces season after season is a great moto jacket. This garment never goes out of style because it is universally flattering and very functional. With its many variations, moto jackets can go from a simple yet classic design for more casual looks to embellished details for a higher end look. This moto jacket from HSN is right in the middle, allowing me to dress it up or down. The rich camel color is perfect for the season, channeling the vibrant hues of Fall foliage. It also has a great stretch lining that makes it breathable and not stiff like some jackets have the tendency to do. 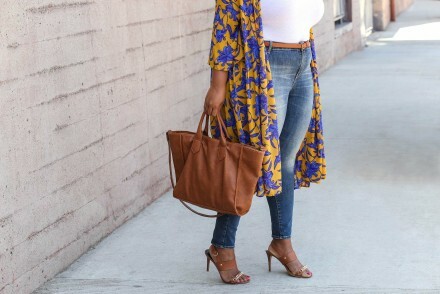 I paired my jacket with skinny jeans (also a staple) that provide comfort and style as well as a simple white tank. All of these products from HSN are part of a Fall Fashion Collection, The Fashion Edit, which includes brands like Wendy Williams, IMAN, Vince Camuto and June Ambrose. HSN has many options for the season from boots to accessories and of course clothing. Be sure to check out their full selection here and snag your favorites for Fall! So so beautiful. you have amazing style! Always on point girl, great outfit. Fierce. Love this Moto look!